Park-Café is located in front of a traditional 1937 Bavarian building that once served as a coffee house and exhibition venue in the middle of Munich's old botanical garden. The beer garden has 1,500 seats in addition to 500 seats in a serviced area. Due to its location in a swanky business district, the Park-Café beer garden is frequented by office workers, while during weekends the venue attracts a young party-going crowd. There are regular music and DJ events at the beer garden and/or in the adjoining restaurant and bar. Visit www.apreswiesn.de for details on future events. During Oktoberfest weekends there are “Après Wiesn” parties (After-Wiesn parties). The Hofbräu in the beer garden costs €8.40 p/Maß (April 2017). When the weather is good the beer garden and self-service area is open everyday from 11am until about 1pm. The restaurant opens 10am on weekends. 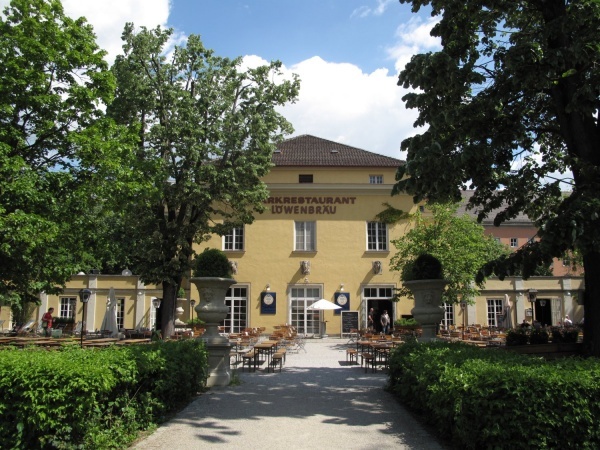 The small park in which the beer garden can be found is located about 200 metres from Hauptbahnhof (Munich's central train station). This page was last modified on 18 May 2018, at 18:51.